It’s probably the feeling of the sound that you remember more than the sound itself – like the deep sound of rolling thunder that rattles you from the inside out, leaving your whole body vibrating, tingling, long after the sound is gone. The legendary, syncopated, uneven idle of the Harley Davidson motorcycle is only part of its mystique. Harley Davidson’s success is built on creating legends – the sound, the look, the culture – all have become an indelible part of American culture. Unfortunately, from Hollywood to the nightly news clips, much has been made of the image of bikers as “bad boys”. Little has been made of their “other” side – their commitment to their communities, their charity work, their brotherhood, their patriotism. A dedication to helping others in their community is what brought Biggs Harley Davidson Director of Marketing and Public Relations, Howie Wahl, to Mountain Shadows. “We are committed to being actively involved in our local community. It so happens that Mountain Shadows is right across the street from Biggs Harley Davidson. Thus the Biggs Harley Davidson Poker Ride for Autism was born. “The 5th Annual Biggs Harley Davidson Poker Ride for Autism will be held on Saturday, January 13th, from 9 am to 3 pm,” says Flor Angel, Program Director, Mountain Shadows Outreach Services. “It will be a GREAT event! The ride starts at Biggs Harley Davidson in San Marcos. The first stop is Morehead Choppers in Solana Beach. “The second stop on the ride will be at Mountain Shadows in Escondido. We’re very excited that the riders will be able to visit our campus to get a feel for who we are and what we do at Mountain Shadows Community Homes – San Diego. They’ll be able to meet some of the residents – and the residents are already looking forward to seeing all the cool motorcycles once again!!! To join the Biggs Harley Davidson Ride for Autism, please register in person at Biggs Harley Davidson, 1040 Los Vallecitos Boulevard, San Marcos, prior to or on the day of the event. For more information, please call Biggs Harley Davidson at 760-481-7300, or stop by their San Marcos store. All types of motorcycles are welcome at the Biggs Harley Davidson Poker Ride for Autism. The entry fee, which includes lunch, is $15 per rider; $20 with a passenger. Lunch for non-riders is $5. Help us rev-up the sound of thunder at the Biggs Harley Davidson Poker Ride for Autism. Your support will benefit Mountain Shadows Foundation long after the sound is gone. Participate by making a donation online! Because Brittany wants to serve. As part of her service, Brittany goes to the naval hospital once a week, each and every week. She visits the amputees. A quadriplegic, born with cerebral palsy, Brittany pushes a special lever on her wheelchair with her right hand to “drive” down the long hospital hallway to find the next patient – perhaps someone who has lost an arm in combat, or a leg to an IED. What do they say to her? Because Brittany has no functional use of her body, other than limited use of her right hand, many might see her as someone in need. But Brittany’s mission in life is to help others. As President of the Kiwanis-sponsored Aktion Club, she leads a group of disabled individuals committed to serving the community. As a leader in People First, an organization dedicated to empowering the disabled through self-advocacy, she inspires others to act. She donates her hair to Locks of Love, a non-profit organization that provides hairpieces to children suffering from hair loss due to cancer. She skis. She lives. She thrives. And so much more. This is why, for the past 25 years, Mountain Shadows has hosted its premier fundraising event, the Annual Fall Classic Golf Tournament and Spa Experience. For Brittany, and all of the individuals we serve. And we are able to serve them because of those who support us. And that makes us feel good in our hearts. Tournament Sponsors: Union Bank, Mountain View Services, Inc.
Dinner Sponsor: Golden West Management, Inc.
Tee Sponsors: Union Bank, Mountain View Services, HUB International, Ron’s Pharmacy Services, Bel Air Investment Advisors, Golden West Management Inc., Ken Stern & Associates, Considine & Considine, Irwin Siegel Agency Inc., The Zenith, Family of Mickey Lawlor, Dr. Howard & Barbara Milstein-La Jolla Dermatology, Neal Stehly, CREA, LLC, Beyond Limits-Mountain Shadows. Social Sponsors: Marshall & Yuko Hung Foundation, J. Serrato’s Landscaping, Golden Boy Mobility, John & Barbara Cambon, Ontario Refrigeration Services, Keven S. Harold, DDS Inc., Gerson Law Firm APC, San Ysidro Development Corporation, Phillip & Mary Joy Blackburn, Gerald D. Gamboni Trust, El Zarape Restaurant, Kimberly D. Blackwell, Janet H. Spain, Bruce Campbell, Todd Caporal, Jerry M. Olefsky, Patricia Alexander, Jay Clicksman, Joshua R. Kleeberger, Wallace & Diane Bowen, Donna Patane. John Martindale – Ailsa Capital, Inc.
Yuri Jacobo – Golden West Management, Inc.
Dan Marrs, John Martindale, Dutch Perry, Terry Trax and Don Vonk. Tournament Winners: Ryan Chessman, Darren Poznick, Erik Quade, and Patrick McCarthy. Thanks, once again, to all of our dedicated supporters. We look forward to seeing you at next year’s tournament on Monday, October 22nd at the Santaluz Club! Boo the Pomeranian – touting two books, a calendar and a stuffed animal line, Boo has amassed more than 7 million friends on Facebook. Grumpy Cat has racked up over 11 million YouTube hits, a Forbes interview, and a spot on The Today Show since her photo was posted on Reddit. Grumpy Cat also has a book and her own website. Tillman the Skateboarding Dog is a droopy-faced bulldog with the soul of Tony Hawk. Tillman holds the Guinness World Record for “fastest 100 meter on a skateboard by a dog” and starred in both an Apple ad and a commercial for Armstrong Flooring. His video has now been watched nearly 21 million times. Well, the dogs – and cats – have had their day we say! And who’s the newest celebrity animal on the block? It’s a cream-colored cavy named Booboo – a guinea pig who already has over 17,000 followers on Instagram. Now, some have called Booboo the “World’s Cutest Guinea Pig” but we beg to differ. You see, Olive House has just adopted the most adorable guinea pig on the planet. Sure the American Blonde, Booboo, is cute in her hipster glasses and has flowers in her hair, but Fozzy, our gentle, golden-furred rodent is much more than just fluff. Finding new and effective ways to serve the Olive House population, to connect with them, to enrich their lives, is ever on our minds at Mountain Shadows. And when Fozzy, the white-nosed guinea pig was first introduced to our resident, Vickie, we knew we were on to something – something really good! “Vickie is non-verbal and doesn’t interact with others much,” says Trisha Brodd, QIDP. “When she saw Fozzy, she got so excited, she squealed and started laughing. That was huge! Now Vickie and Fozzy are best friends. Vickie and all of our non-verbal residents love touching him and holding him. “Fozzy was born to a family in Descanso and given as a gift to my parents,” says Trina. “When my parents had to move, Fozzy became part of our family. As the kids have become older, and more involved in sports and school activities, we had less time for him. He is very social- he would talk to me every morning and gives great Eskimo kisses. I felt he needed more interaction and attention than we could provide. I struggled with giving him to just anybody though as he is a special animal. “While sharing my pet woes with Stacy, she had the great idea of bringing Fozzy to Mountain Shadows. She shared the new campaign “Because I care” and thought Fozzy could be incorporated into this idea. Fozzy would not only provide companionship for the residents but also encourage their participation by allowing them to care for another living being. “It was a little bit of a hard sell to my children initially. But after visiting the homes and meeting some of the residents, we all knew Mountain Shadows would be a perfect fit for Fozzy. So, sure, Booboo is cute with her heart-shaped glasses and flowers in her hair, but Fozzy is all that – and so much more. He wiggles his nose and makes Vickie laugh. He purrs when Steve pets him. He runs barefoot through the grass for Andrea as she watches from her wheelchair and squeals with delight. And he chills in the La-Z-Boy with Johanna at the end of a busy day. So move over Boo, and Grumpy Cat, and Tillman, and even Booboo too – because Fozzy’s the World’s Cutest Guinea Pig in our eyes, and the most loved too. Help us raise awareness about Mountain Shadows and make our Fozzy the newest internet sensation – click on the icons at the beginning of the story to like, share, and tweet his story and pictures with everyone you know! Mother’s Day is Sunday, May 14th. donate to Mountain Shadows Support Group! The shiny new Mercedes-Benz convertible crashed into the wall of Laurel Park house as Marquez squealed with glee. The car hit the wall again. Then, his eyes bright, lost in a world of his imagination, he revved the engine, screeching out a tight 360 with the remote-controlled car. Many of you may know Marquez, who suffers from Duchenne’s muscular dystrophy. He’s wheelchair bound but nothing can contain his free-wheeling, live life to the fullest spirit. He loves fast cars, baseball, and his older brother Maurice, who is afflicted with the same disease. The brothers were orphaned several years ago when both of their parents died within a month of each other. They were moved to Mountain Shadows soon after. If all wishes came true, Marquez would be able to stand on his own, pick up the keys to a real Mercedes and walk on his own two legs to the car, then get in and DRIVE! Unfortunately, due to the debilitating effects of Duchenne’s, Marquez will never be able to do a simple thing like drive a car. But that hasn’t stopped him from dreaming. When he was a boy, like most boys, he played with toy cars and pushed them along the carpet mimicking the engine’s roar – VROOM! VROOM! And he dreamed of being free to drive – drive to his heart’s desire on the open road with the top down. And with his imagination on fire, he could almost feel the warmth of the sun on the back of his neck as he drove. He could almost see his girlfriend’s long blonde hair blowing gently in the wind as they cruised down the 101. And he would smile and laugh, and sometimes his heartbeat would even quicken as he played with those cars, because the story playing out in his imagination felt so real. Like many young men his age, Marquez still dreams of sports cars and speed. In fact, when asked what he wanted for Christmas this year, he had but one wish – a remote-controlled toy car. It had to be remote-controlled because he can no longer get down out of his wheelchair to push the car along the floor. 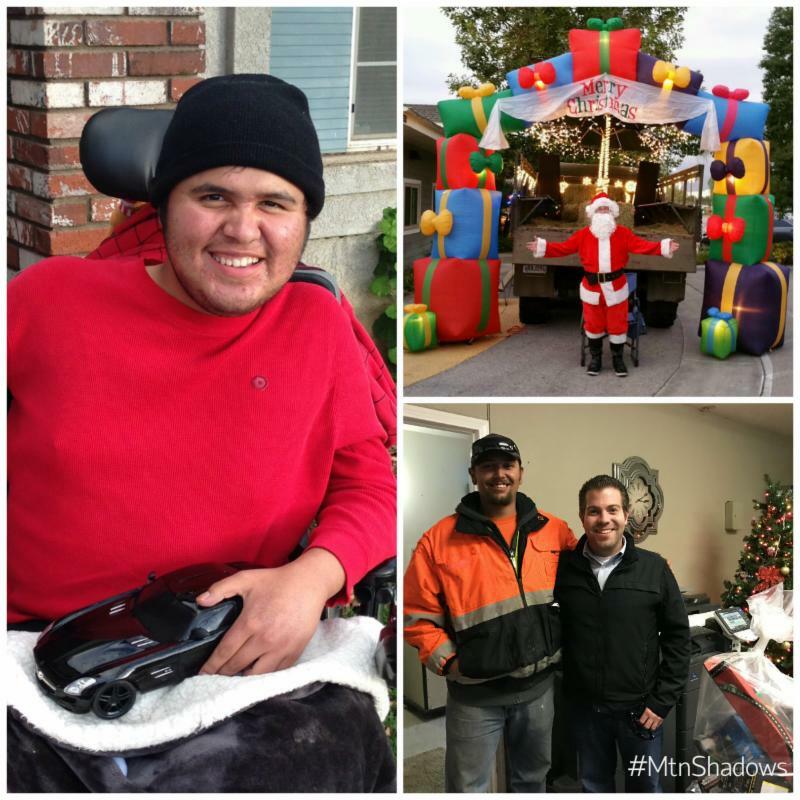 Thanks to Eagle Transportation, his Christmas wish has been granted and Marquez is now driving in his dreams. Truly a blessing, especially for Marquez, who otherwise most likely would not have received anything for Christmas. Says Tom Holt, owner of Eagle Transportation, about why they contacted Mountain Shadows to make this incredible gift, “I love kids. I love ’em point blank. If my wife and I were younger, we would adopt every one of the children at Mountain Shadows. We’ve always been close to our own kids. We’ve devoted our lives to our kids to be honest. And we like to do it. A lot of people, when they have kids, take one big, fancy vacation each year. We do everything as a family – camping, desert riding, school activities, everything. We stayed active and involved with our children every day. And we enjoyed it. “We started Eagle Transportation about 15 years ago. Since that time, we’ve grown into a multi-million dollar company that provides a wide variety of trucking and transportation services throughout the L.A. basin. We believe it’s important to take time out of life to make someone else happy, someone who can’t do it for themselves. I think if more people took time out to do this, it would be a very nice world. “I’ll just tell you that I’m a very kindhearted person. Anyone would tell you that. I know I can’t take my money with me, so I try to share it and make as many people happy as possible. That’s probably why I’ll never be rich. “We started doing this about 4 years ago. We have an army truck and it’s all decorated with lots of lights for Christmas. We started out caroling in the neighborhood on Christmas Eve. Then we started visiting Totally Kids Rehabilitation Hospital in San Bernardino. We park the truck and play Christmas music for the children. Santa and his elves, my grandchildren, are there. We hand out lots of gifts. The kids really enjoy it. We learned about Mountain Shadows through Totally Kids. “It was rainy and cold on the night Tom and Brandon delivered the toys,” adds Janet. “But as they were taking the toys off the truck, they were both smiling the whole time. I think Tom is a big kid at heart. He likes toys and he loves giving. The Mercedes slammed into the wall again. Marquez maneuvered it back to the center of the room, still lost in his beautiful dream – where his feet can press the gas pedals, where his hands can turn the steering wheel, where he can drive in the sun with the top down, feeling the wind dance across his thick black hair. Thank you, Eagle Transportation, for making this Christmas wish come true for Marquez – and all of our children at Mountain Shadows – Riverside. Because you took time out to do this, our children’s world is a little bit nicer. Tom Holt, you are a very kindhearted person. And we will tell everyone that. to live more fulfilling and active lives, please click here.